[The White House, Oct. 10, 2014] — Today, President Obama will use his authority under the Antiquities Act to establish 346,177 acres of national forest land in the San Gabriel Mountains in southern California as a national monument, permanently protecting the popular outdoor recreation destination to increase access and outdoor opportunities for the area's residents. This monument designation builds on more than a decade of public support from business, tourism, environmental justice, conservation, academic and cultural preservation communities and on the leadership from members of Congress. For many residents of Los Angeles County — one of the most disadvantaged counties in the country when it comes to access to parks and open space for minorities and children — the San Gabriel Mountains provide the only available large-scale open space. In addition to permanently protecting this land, the monument designation will create new opportunities for the Forest Service and local communities to work together to increase access and enhance outdoor opportunities. Building on the monument designation, leading philanthropies are also announcing commitments to help jump-start public involvement and restoration of high-priority projects in Los Angeles County and the new San Gabriel National Monument. 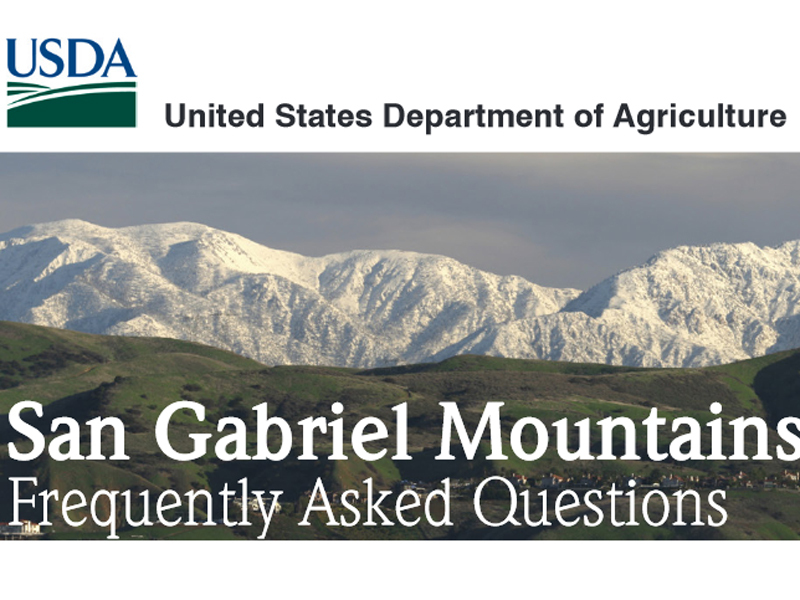 The National Forest Foundation announced that they will commit $3 million for the San Gabriel Mountains National Monument Fund to respond to community priorities and support restoration and stewardship of the new national monument. In addition, the Hewlett, Wyss, Packard, and California Community foundations, the California Endowment, and the Resources Legacy Fund are working to establish a $500,000 San Gabriel Partnership Fund to support recreation and habitat improvement projects in the monument and surrounding communities. Secretary Vilsack and the Forest Service are also stepping up by investing more than a million dollars in additional education staff and maintenance work on the monument's trails and picnic areas. More than 15 million people live within 90 minutes of the San Gabriel Mountains, which provides 70 percent of the open space for Angeleños and 30 percent of their drinking water. The 346,177 acre site contains high-quality wilderness areas, habitat for rare and endangered animals like the California condor, and a rich array of cultural and historical features. Today's action builds on steps the Administration has taken over the past five and a half years to expand access to millions of acres for recreation, make historic investments in restoring critical landscapes through the President's America's Great Outdoors initiative, and permanently protect areas significant to our Nation's rich history and natural heritage. All of these efforts support an annual outdoor economy that includes approximately 9 million jobs and $1 trillion in economic activity, according to the National Fish and Wildlife Foundation. The new monument area overlays about half of the Angeles National Forest, which hosts more than 4 million visits each year. Based on 2012 data, the U.S. Forest Service estimates that the Angeles National Forest alone contributes more than $39 million to the local economy each year. Since President Theodore Roosevelt designated Devils Tower National Monument in Wyoming in 1906, the Antiquities Act has been used by 16 presidents to protect unique natural and historic features in America, including the Grand Canyon, the Statue of Liberty, and Alaska's Admiralty Island National Monument. President Obama has previously used his authority under the Antiquities Act to create or expand 12 other National Monuments across the country, including the Pacific Remote Islands Marine National Monument in the south-central Pacific Ocean last month — the largest marine reserve in the world that is completely off limits to commercial resource extraction. With this designation, President Obama has now protected more than 260 million acres of land and water, nearly three times more than any other President since the Antiquities Act became law in 1906. The peaks of the San Gabriel Mountains frame the Los Angeles skyline and offer hundreds of miles of hiking, mountain biking, motorized, and equestrian trails as well as campgrounds to the area's diverse residents. In addition to providing drinking water, the San Gabriels' rivers support rare populations of native fish, while the vegetation found in the monument supports native wildlife and insect species, including pollinators important to farmers. The area is also rich in cultural and scientific history. More than 600 archeologically and culturally significant sites are found within the new monument, such as the Aliso-Arrastre Special Interest Area, which features rock art and cupules that exemplify more than 8,000 years of Native American history. The new monument is also home to the Mt. Wilson Observatory, where Edwin Hubble discovered galaxies beyond the Milky Way and Albert Michelson provided the first modern measurement of the speed of light. Improving public access and recreational opportunities within the monument will help address the region's public health challenges. Studies have shown that increasing recreational access to public lands translates to higher levels of youth activity and lower youth obesity rates. National monuments also play an important role in supporting local economies. A recent study by the independent and nonpartisan research group, Headwaters Economics analyzing the impacts of over a dozen monuments found that, without exception, local economies grew following the monument's designation. 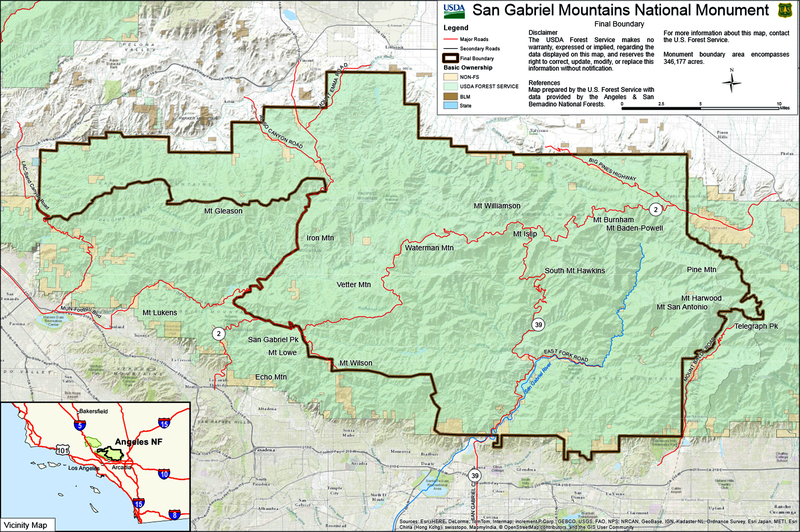 The San Gabriel Mountains National Monument will be managed by the U.S. Forest Service and will be the eighth national monument under Forest Service management. There are more than 100 national monuments across the country managed by the Forest Service, National Park Service, U.S. Fish and Wildlife Service, Bureau of Land Management and National Oceanic and Atmospheric Administration.